My eldest daughter is football crazy. She loves football. Playing it and watching it. She goes into the garden after school and lays out stones on the garden to practise dribbling a ball around and when she isn't doing that she is kicking a ball against my fence as target practise. 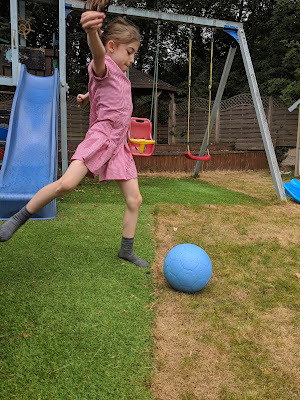 I love watching her play and I am trying desperately to find somewhere to take her to help her practise more but it needs to fit in with all the other sports she currently does. She isn't the only football mad person in our house. I say person what I actually mean is our dog. He also loves footballs. I have never seen a dog chase a ball as much as J does. I have also never seen a football get destroyed as quickly as J can do. Leather footballs last around 2 minutes on a good day, plastic ones less than 30 seconds. It really frustrates my eldest and we have to constantly remind J to 'leave it' whilst she is playing, though often her forgets. You can see the frustration building up inside him to play. One World Futbol got in touch regarding their incredible, indestructible football that can withstand any playing conditions, it never needs a pump and never goes flat. It sounded like a solution to our problem. A ball that my eldest and J could use together? Would this be too good to be true? The ball was developed by an entrepreneur in the US with support from Sting: “One World Play Project is inspiring children to realise their own potential through this nearly indestructible ball. It’s a simple idea, but it makes all the difference in the world.” Sting, musician, entertainer and humanitarian. For every One World Futbol sold a percentage of sales goes towards providing footballs to organisations working with youth living in disadvantaged communities around the world. Collaborating with sponsors, organisations and individuals, One World Play Project has brought the power of play to an estimated 60 million youth in 185 countries worldwide. On the 24th July our One World Futbol arrived. J ran off with the package before I even had chance to open it. He would make an excellent police dog if they ever needed a dog to find a ball. I eventually managed to open the package and since then J has not let the One World Futbol out of his sight. I was worried he might destroy it before my eldest got home from school but despite all the teeth and claw marks on it, it is still going strong. Strong enough to withstand my eldest practising against the fence panels. Just to show how indestructible the One World Futbol is, here is a video of J running around with it. 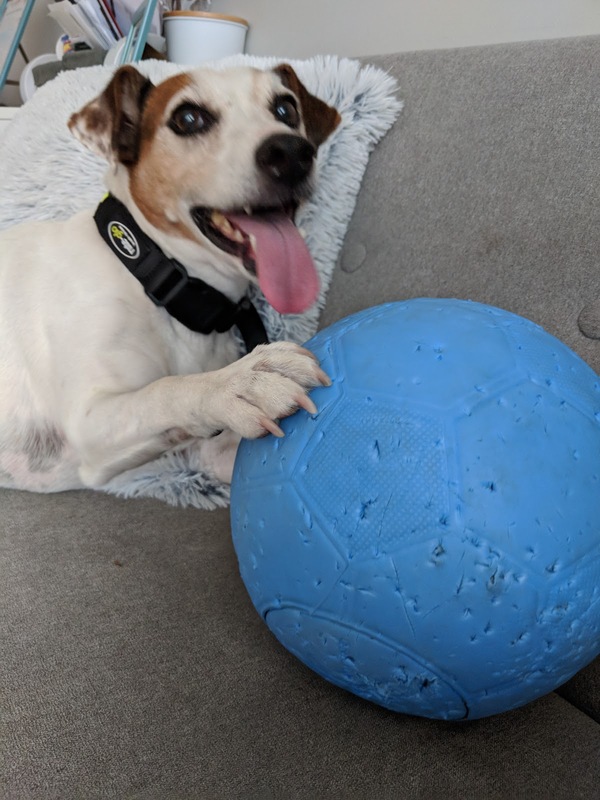 It is safe to say that over a week later J still loves the One World Futbol and my daughter finally has a ball that will last!